You can have the BEST of both Worlds. The portability of the Palm and the power and speed of the PC for your EMR needs. 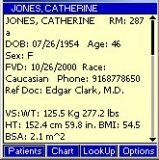 Synchronize your last 2000 patient records, your medical colleague phone numbers and the next 90 days of your medical schedule with your Palm device. Create clinic notes on your palm to print out and synchronize with Turbo-Doc for the PC. Looking for the Pocket PC? Sample Screen shots of Turbo-Doc for the Palm. You may download the Turbo-Doc for the Palm from the OnLine Demo page.